Little Charlie was a last minute addition to my schedule, but her family got her in within the perfect newborn window for photos. She was just six days new and was a wonderful sleeper for her newborn debut. 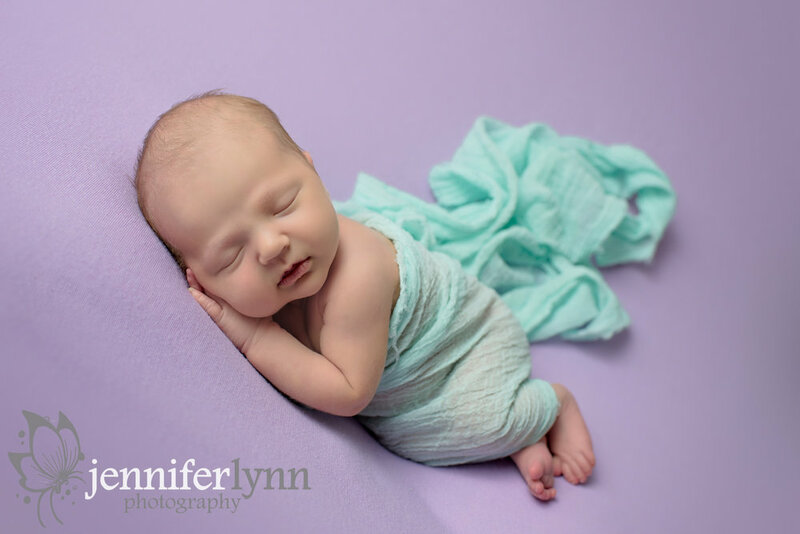 In fact, I believe she tied for the fastest newborn session with a few other babies, as she settled into each pose so quickly and just slept away. That’s always a nice gift to get me out of the hot studio quicker and still deliver lots of beautiful photos to the family! Her grandma originally called and scheduled the session for her first granddaughter, and she mentioned mom had decorated the nursery with a moon type theme with purples. I made sure to include that special moon prop for Charlie and get some adorable images of her on the moon so they can decorate her room later. I also had fun pulling out some of the mint color for her as grandma mentioned there were those accent colors in the room. Charlie really made me smile in some of her little poses as she truly settle in right away. She even flashed me a quick grin in the bucket which I was lucky enough to capture! A big thanks to this family for coming out for photos last minute! I’m so glad it worked out with everyone’s schedules to get these special newborn photos before she changes and grows.